Student Council President Lilly Hutton ’18 speaks at Columbia’s assembly “We Rise: A Right to Safety” in the school auditorium. 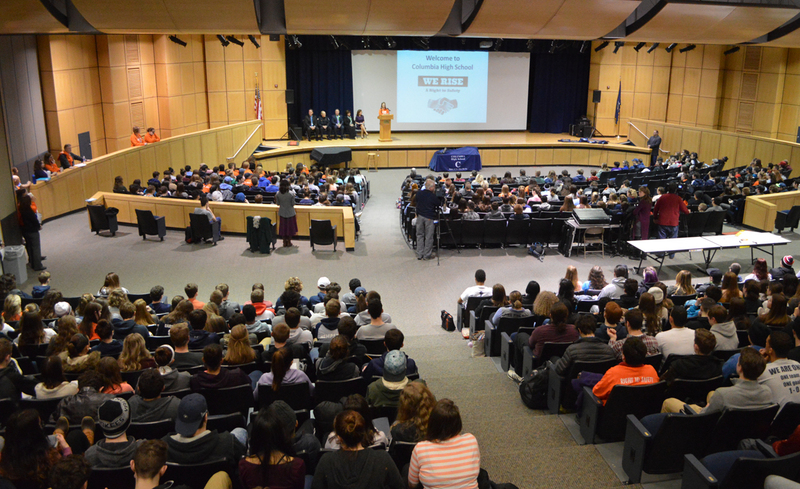 Columbia High School students and staff came together with local and state officials on Wednesday morning, the day of the National School Walkout, to discuss the topic of school safety in response to the tragedy at Marjory Stoneman Douglas High School and other incidents of school violence across the United States. 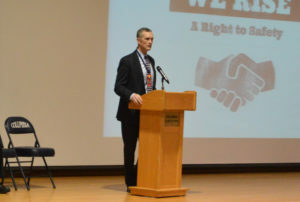 The focus of Columbia’s “We Rise: A Right to Safety” event was to empower students to respond in positive ways to school violence through proactive, thoughtful civic engagement. The school-wide assembly was developed by Columbia High School student leaders. The event began with a moment of silence in honor of the victims from Marjory Stoneman Douglas High School in Parkland, Florida. Then Columbia student leaders introduced a number of speakers to discuss issues concerning school safety. Student Council President Lilly Hutton ’18 helped organize the event with classmates Morgan Jones ’18 and Heather Pangburn ’19 out of a desire to end gun violence in schools. “It is important that students realize they have a voice and can rise up for change,” Ms. Hutton said. One of the most emotional moments of the morning assembly came from former Columbia teacher and coach Michael Bennett, who had been shot by a student in Columbia High School in February 2004. He and former principal John Sawchuk became heroes during that incident by stopping the gunman before anyone was killed. Former Columbia teacher and current assistant superintendent at Schodack CSD Michael Bennett speaks to students at Columbia’s “We Rise” event. Mr. Bennett said he felt it was his “obligation” to now talk about that incident. “Decide to make a difference. Decide to have a voice. And decide to make change,” Mr. Bennett told the students. In addition to the guest speakers, Columbia students discussed safety at Columbia – what they think works well and what they think needs to be improved upon. They also wrote letters to Marjory Stoneman Douglas High School survivors and are selling orange “We Rise” shirts to benefit them.